Hello everyone, and welcome to the next instalment of my World of Darkness Library series. This time I am going to be talking about the game Werewolf: The Apocalypse, 20th anniversary edition. There are affiliate links in this post. The World of Darkness is a bleak setting for adult games of personal horror and despair. The night is stalked by Vampires, feeding on blood and entrapping mortals in their schemes and powerplays as they war with each other for feeding grounds. Corporations turn humans into drones, cogs in their vast engines of capitalism depleting the resources of the Earth and replacing them with a commensurate level of pollution and poison. Normal people, driven to despair by circumstance or agency commit evil acts upon their fellow human beings. And in a setting like this, it is easy to assume that the end is nigh, and its arrival will be inexorable and final. However, there is one ray of hope for the world. There are champions of Gaia that stand against these evils and taints, that vow to fight to their last to destroy the corrupter that encircles Earth within its coils. These defenders are Werewolves, the Garou; Gaia’s champions. And in Werewolf the Apocalypse, you play one of these champions. with player pitted against player and Games Master as legions of supernaturals compete for power, be that personal power or territory. The protagonists in these games favour being selfish, or at least self interested. Not so with Werewolf: The Apocalypse. Whereas in Vampire, it is player versus the world in a game of politics, survival and horror, in Werewolf it is the pack versus the world in a game of survival, war and horror with a tiny bit of Garou politics (more if you have a lot of Shadowlords in the game…). More than any other Game I have played in the World of Darkness (and admittedly, I have not played it much), Werewolf is the game where you get to play the Good Guys. Or, more accurately, the guys fighting for the Greater Good. For those unaware of the distinction I will use the Werewolf setting as an example. Werewolves are locked in a war with a vast entity known as the Wyrm; a supremely powerful spirit of corruption that was once part of the natural cycle of life. The Wyrm has many servants, monsters, corrupted werewolves and even unwitting servants who merely respond to their most vicious impulses as a result of bing tainted by banes. If the Werewolves were fighting as the Good Guys, they would meet the Wyrm’s direct agents in battle and slay them whilst trying to free the unwitting from the taint and thus preserve human life. Some Garou, that is the name werewolves have for themselves, maintain this approach. However, there are those that see the rampant spread of humanity, and thus cities and industry as the root cause. There are those among the Graou that would cull the human population to a more manageable level (which in their mind would be zero) followed by razing every city to the ground allowing the Wyld to reclaim. As I said, they are creatures that fight for the greater good – in this case the greater good of Gaia. Fortunately for humanity in the World of Darkness the most vocal advocates of a cull, the Red Talons, are in the minority. So Werewolves wage war on the Wyrm without a cull, however, they fully accept human casualties as acceptable (as much as any desperate soldier might). The Garou are creatures of duality and contradiction. They are defenders of Gaia, however they are also potentially some of the most ferocious killing machines on the planet. Gifted with the ability to shapeshift at will into multiple forms from regular wolf, to 9 foot tall bipedal wolf man, and empowered by primal rage that gifts them speed, ferocity and the ability to fight on despite grievous wounds, it is perfectly reasonable that humans human fear werewolves. This great rage is not the only weapon in the arsenal of the Garou. They are creatures of flesh and of spirit, which allows them to build up spirit energy called Gnosis. Gnosis allows them to fuel gifts taught to them by spirits, it can be used as currency to barter with said spirits and most important of all, it allows them to step sideways into the Umbra; the spirit world. With access to the Sprit World, Garou can travel to various realms to find lost lore, hidden relics or even the memories of long dead heroes. This means that a game of Werewolf: the Apocalypse can easily shift between urban guerrilla raid style warfare chronicles, intrusion and espionage stories or even quest based adventures in strange realms (I will talk more about the realms in a future post as there is an excellent source book called Umbra: The Velvet Shadow that covers them in detail). 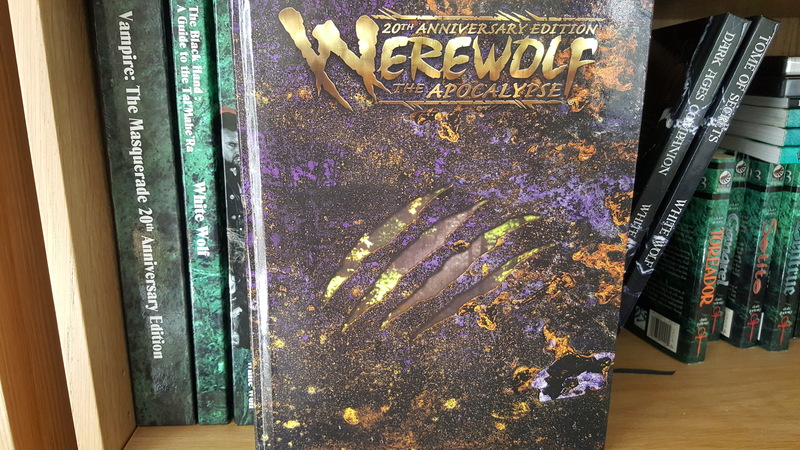 As with the other 20th Anniversary Editions, Werewolf: The Apocalypse is massive weighing in at over 550 pages jam packed with all the lore and rules needed to play the game. The book opens with a condensed potted history of the world from a Garou perspective noting their first cull of humans, the eventual rise of cites, the tragedies of the Garou nation including the fall of the White Howler tribe to the Wyrm and the loss of the entire Croatoan tribe in battle, as well as the various wars started by Werewolves that exterminated a lot of their would be allies. Which shouldn’t come as a surprise that for all their great strengths, Werewolves are sometimes their own worst enemy, being a race bred for war which leads to more aggressive approaches when a handshake would have done. To put in other terms, once upon a time there were Wereboars, and Werebats, and Were Tasmanian Devils (or Tigers). The Garou Nation wiped them all out because their warlike ways breeds xenophobia. They also inflicted heavy casualties on other changing breeds, such as the Werebears, meaning that most of the other Fera don’t trust them anymore. (I will talk more about the other Were creatures in greater detail in a future article as they also have a sourcebook called Changing Breeds). I have to say, Playing Werewolf was actually harder for me than Vampire as there is a lot more to creating your character and a lot more that you can do. In vampire, you create a background, choose a clan and pick some disciplines from the available clan disciplines (oversimplified, but basically true). In Werewolf: The Apocalypse, you create your background, pick your tribe and then your breed (Were you born a human, wolf or something else) and what Auspice (phase of the moon) you were born under. Tribe tends be your Garou blood family, breed dictates who your parents were and tends to inform whether you are capable with technology or more proficient as a beast, and auspice dictates your role in the pack. I personally prefer Homid (human breed), Ragabash (Auspice), Shadowlord. (Ragabash are tricksters whose role is to challenge the status quo and ensure the pack doesn’t stagnate). Garou start with gifts from each of their tribe, breed and auspice. However, on top of this, Garou can learn rites and rituals that they use to perform at ceremonies or confer bonuses at certain times or even create fetishes. Fetish items are wondorous artifacts that have spirits bound in them creating mighty effects. One of the most common fetishes I encounterd were Klaives and Grand Klaives – bladed weapons that do massive damage to supernaturals, that shrink or grow to accommodate whatever size your hand currently is. Basically, there was a lot to take in at first. However, I would say that if given the opportunity I would happily play in a game of Werewolf: The Apocalypse, taking on the role of a feared vampire killer or maybe even a crazed mystic that has traveled too deep into the Umbra and has seen things that cannot be unseen. Whatever character I choose, I feel confident I would have fun and heartily recommend Werewolf: The Apocalypse 20th Anniversary Edition to anyone who is looking for a game of war and horror. Scrooge – The Board Game – Coming to Kickstarter September 2017!